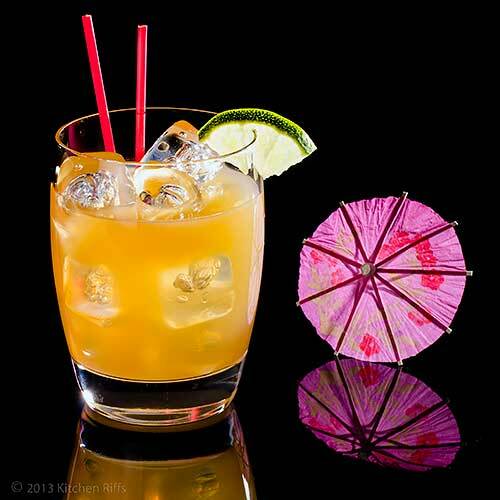 Tiki drinks strive to be exotic — which is why they’re often served in unique mugs and glasses. 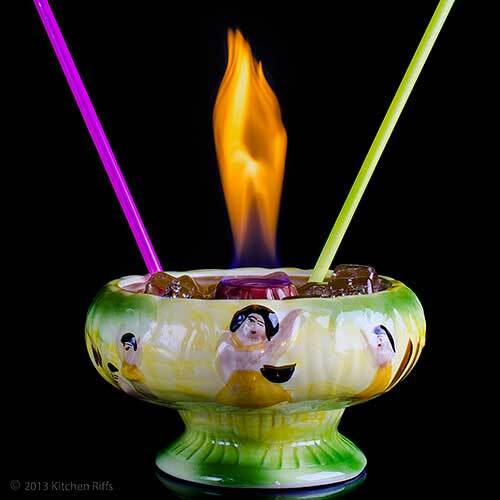 And one of the best Tiki potions is the Volcano Bowl Cocktail (sometimes called the Flaming Volcano). Traditionally, this drink is served in a communal volcano-shaped bowl (usually one adorned with “South Sea” images — the tackier the better). It tends to be prepared in hefty quantities — enough for four people (or at least two particularly enthusiastic drinkers). Everyone sips from long straws to avoid getting singed by the flaming crater at the center of the bowl. Unless you’ve been to a Tiki- or Polynesian-themed restaurant, you may never have sampled one of these. After all, your local housewares shop probably doesn’t carry volcano bowls. And unless you’re serving a crowd, the quantities that most recipes yield are a bit unrealistic for a casual before-dinner drink. But no worries. You can easily scale down this recipe and serve the drink in an ordinary glass. Or, if you’re planning a party, why not go all out? It’s easy enough to buy volcano bowls online. And this recipe is perfect for a crowd. This recipe contains 6 ounces of booze and almost 10 ounces of other ingredients, so it makes a lot — at least enough for 2 people, and still generous for 3. If you don’t want that much, it’s easy to cut the recipe in half (or less) for a “glass” rather than a “bowl” sized recipe. The pictures accompanying this post show both. 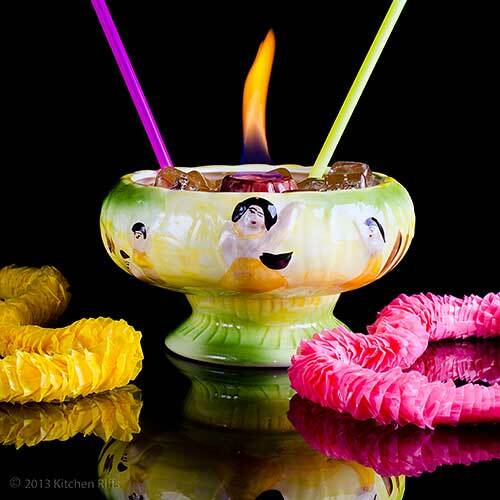 But this drink really is fun to serve in a volcano bowl, particularly at a party. If you can’t find a volcano bowl locally, you can buy one from Amazon (that’s where I got mine). While you’re at it, you may want to order some long (17-inch) straws so you and your guests can drink from the bowl (Amazon advertises these prominently when you search for the bowl). Your handy volcano bowl will work with other Tiki drinks, too — though you’ll probably need to double or triple their recipes. The bowl I’ve linked to holds 32 ounces. You’ll fill about half of it with ice, so you’ll need about 16 or so ounces of liquid to fill it properly. There are many Volcano Bowl recipes out there, but I trust Jeff Berry (a/k/a Beachbum Berry) when it comes to Tiki. The recipe I use comes from his Beachbum Berry Remixed. And BTW, if you have any interest in Tiki drinks, you need this book. The Volcano Bowl Cocktail takes several minutes to mix, and serves 2 to 4. You can serve it either in a bowl (volcano shaped or otherwise) or in glasses. Add all ingredients except the optional 151-proof rum or pure grain alcohol to a large cocktail shaker half-filled with ice. (See next step if you don’t have a cocktail shaker large enough to hold everything.) Shake vigorously until chilled, 20 to 30 seconds. Fill the large outer circle of the volcano bowl with ice cubes. Place the volcano bowl on the serving table (so you don’t have to move it after you’ve filled it) and strain the contents of the cocktail shaker (or other container) over the cubes. If using glasses, strain the contents into tall or rocks (Old-Fashioned) glasses filled with ice cubes. If you’re going this route, a garnish of lime wedge and a little cocktail umbrella are nice touches. If you want to ignite the crater — and be aware you're literally playing with fire; you are risking an accident so be very careful, don't do this after you've had a round of drinks, and did I say be careful? — fill the crater of the volcano cone with a small amount of 151-proof rum or pure grain alcohol (the crater will probably hold no more than 2 or 3 tablespoons). Cap the bottle before you even think about lighting a match (you don't want to ignite the vapors from the bottle). Be aware that the vapors from both these alcohols are extremely flammable — so be careful about how you light matches around them. Use a match with a long handle, and light it away from the bowl. Then, making sure your head isn't above the bowl in case the alcohol flares up momentarily, carefully move the match over the crater, maybe an inch or two above it. The vapors from the alcohol will ignite. See Notes for more safety precautions! Distribute long straws to your guests, and enjoy. Demerara rum, which comes from Guyana, has a seductive “smoky” flavor. It’s authentic for this drink, but it can be difficult to find. In US liquor stores, you’re most likely to see either the Lemon Hart or the El Dorado brand. If your liquor store doesn’t carry demerara rum, ask whether they can order it for you. Alternatively, you can order it directly from online liquor sources. If you can’t get demerara rum, you can substitute dark Jamaican rum (Meyer’s would be a good choice). The flavor of the drink won’t be exactly the same, but it will still be quite good. For gold Jamaican rum, I suggest either Appleton Special Estate or Appleton Estate V/X. But if you favor a different brand, it will probably work OK (just don't use one that’s spiced). 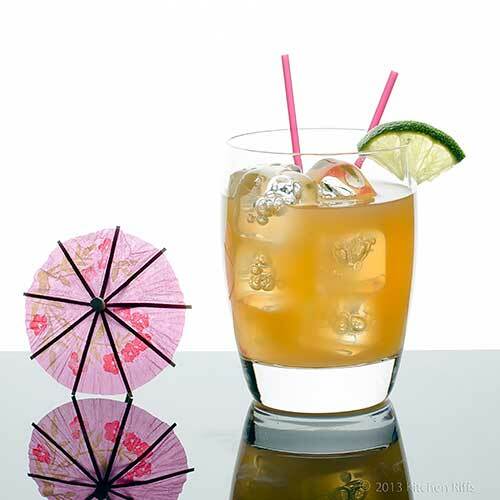 You can even use a non-Jamaican gold rum. Again, the flavor of the drink won’t be exactly the same as the original — but IMO, this is a cocktail you can take a few liberties with. The brand of Puerto Rican gold rum you’re most likely to see in liquor stores is Bacardi. Beachbum Berry often substitutes gold Virgin Islands rum for Puerto Rican in this drink. The brand of VI rum you’re most likely to see is Cruzan. White grapefruit juice works best in this drink IMO. But if you can’t find white grapefruit, you can substitute pink or red. Citrus juices always taste best when freshly squeezed. When it comes to lime juice in particular, there’s really no substitute. But for this drink, you can probably get away with using canned unsweetened grapefruit juice (you’ll lose some brightness in the flavor, though). It’s a good idea to pour freshly squeezed juices through a strainer before adding them to this drink, to reduce the amount of pulp. You should use real maple syrup in this recipe. Even though the quantity of syrup called for is small, you’ll notice the difference. The artificial stuff tastes, well, artificial — and it leaves a distinct aftertaste. The recipe calls for using 151-proof rum or pure grain alcohol to light the fire in your “volcano crater.” In liquor stores, the brand of overproof rum you’re most likely to see is Bacardi. For pure grain alcohol, Everclear is the brand I always see. The recipe specifies these types of alcohol because their vapors are so flammable. So be very careful about lighting matches around them. Make sure you don’t have your head over the volcano bowl when you light it — otherwise, you risk being singed by a fireball. DON’T EVEN THINK about using anything other than high-proof alcohol for your fire source. Using anything else (lighter fluid, for example) could be a disaster. When you light the vapors of overproof alcohol, the flame may initially reach 5 inches or more, but will quickly settle down. With the amount of alcohol you’re using in this recipe, the flame will probably burn about 5 minutes or so. If you happen to dribble some overproof alcohol down the outside of the volcano cone, you may see a line of blue flame run down the side. Don’t worry — it will soon burn itself out. An additional note about fire safety: It’s unlikely that you’ll set anything else on fire when serving a Volcano Bowl Cocktail, but accidents do happen. So have a fire extinguisher handy (you want one that’s rated ABC, so it can handle flammable liquids). You don’t need to keep the extinguisher at your side, but make sure it’s located where you can readily access it if necessary. Although restaurants usually serve this drink in a volcano bowl, it also looks swell in a glass. I mixed a big batch so I could take pictures, but it was too much for the two of us — we didn’t finish it. Next time I’ll cut the recipe in half, and serve it in glasses. Unless we’re hosting a luau, of course. You do set the world on fire, John! And Mrs. KR! Great post and fun drink. Never would have thought that it contained maple syrup! Hi Abbe, this post was fun to write! And the drink is pretty good too. Thanks for the comment. Love the novelty of this cocktail. Would be fun for a dinner party! I also love the dialogues between you and Mrs. K R. Very entertaining. Another great post! Hi Bill, those dialogues are so much fun to write! And this was a fun drink to write about and photograph (and drink, too!). Thanks for the comment. Hi Ashely, this really is fun! The drink is good, but the flame is more fun. ;-) Thanks for the comment. I think this is the first time I've seen you have to supply so much safety information for a cocktail. You should have a special warning for people with bangs. :) Well, this is definitely a new one on me. Have never heard of the drink nor a "volcano bowl". Both sound like fun. Love all of the rums in this drink, but then I do like rum! Thanks for the alternate process for those of us that don't have a shaker. Now I know so I can better fulfill the "shaken, not stirred" orders. A fun post John and as always - great pictures. Especially like the first one! I bet you have the best parties! This is so fun and unique! How fun!!! I love that you got that special serving bowl (glass?). I had one of these once at a restaurant and it was super strong! I've never had this but I'm game...sort of loved the Blue Hawaii I scoffed at last week as too blue and too sweet! Hi MJ, rolling drinks probably predates shaking - shaking is just a quicker way to do the same thing. This really was a fun post! Thanks for the comment. Hi Chris, this really is a fun drink - and not one most people have had. Great for parties! Thanks for the comment. Hi Alyssa, that bowl is so tacky, isn't it? ;-) I love it! Thanks for the comment. Hi Barb, I'm pretty sure I'm going to end up doing the Blue Hawaii towards the end of the month. ;-) Definitely have to do something blue, even though it's such a weird color for food (even blueberries aren't really pure blue). Looking forward to your tropical cocktail! Thanks for the comment. I love the cup on a first picture. It says "let's have fun tonight"! Hi Marta, it does indeed say let's have fun! Thanks for the comment. Hi Nee, anything Tiki is so much fun, isn't it? And who can resist a flaming drink? Thanks for the comment. Who knew I needed a volcano bowl???? This is such a fun cocktail...I think I need to plan a tropical themed party! I'm pretty sure I would remember a Volcano Bowl if I ever saw one, John. Now I am totally intrigued. What a presentation it must make! I agree with Nee, Tiki Month is going to be great and you're off to a flaming start! Hi Liz, I know what you mean: there you are, quietly minding your own business, and all of a sudden and out of the blue you see a picture of a volcano bowl, and suddenly know your destiny. ;-) It's a lot of fun - I'll bet you'd enjoy one. Thanks for the comment. Hi Louise, pretty hard not to remember a volcano bowl! And I'm glad to be off to a flaming start. I think. ;-) Thanks for the comment. This looks like a fun drink. I love the volcano bowl. I can't wait to see what else you have in store for Tiki month. Hi Dawn, loads of good stuff to come for Tiki Month! And this really is a fun drink. Thanks for the comment. Hi Charlie, maple syrup really is an unusual ingredient in cocktails, isn't it? I think I've only seen it in perhaps two or three, including this one. Thanks for the comment. Hi Carolyn, this really is a blast from the past, isn't it? And you definitely want to watch out for your hair around one of these! Thanks for the comment. I love this.. absolutely in love with that bowl and the whole idea of sharing one of these! What a fun summer drink for a party.. and it would be a party after sipping one of those, or two:) I'm glad you told us where to buy those bowls, this is a great idea! I love drinks that are fun like this. Holy cow. I have never seen or even heard of this drink before. I think you've outdone yourself, and have no idea how you'll top this next week. Love, love, love the volcano bowl. I love the whole Don the Beachcomber era. There is really no place that I'd rather have a fruity and fun drink than in a tiki bar wearing a lei. Your drink captures that whole spirit. I'll take one all to myself and an order of crab rangoon on the side. Now that's my idea of paradise! Hi Smidge, this really is one of those "fun" drinks that definitely needs to be shared - much more fun that way. You should get one of these bowls - they're loads of fun. Thanks for the comment. Hi Maureen, this drink definitely defines fun. Or something. ;-) You should have kept the bowl! Thanks for the comment. Hi Beth, probably can't top this visually next week, although next week's drink is probably a tastier drink. ;-) But you'll just have to wait to find out about it! Thanks for the comment. Hi Karen, that's a pretty hefty drink for one! But you're so right that pairing this drink with crab rangoon is paradise. ;-) Thanks for the comment. Good lord, that looks amazing! I've told you this before, but I adore your cocktail series, it's so fun! Hi Kristy, it was a lot of fun to photograph. And then drink. ;-) Glad you're enjoying the Summer Sippn' Series! And thanks for the comment. This drink will definitely get the party started. Hi cquek, it's really a fun drink. :-) Thanks for the comment. Hi Karen, that it will! It's perfect for a party. Thanks for the comment. Well, if you don't have a volcano bowl, you at least need some cocktail umbrellas, right? :) White grapefruit juice sounds like a very interesting and flavorful addition. Love this post, it made me smile and is so well written. Hi Laura, cocktail umbrellas really are a fun accessory! Thanks for the comment. Hi Daniela, it's a fun drink! Thanks for the kind words, and comment. Wow, now that's a cool drink John! You photographed it beautifully. Well done! Hi Anne, isn't this an interesting drink? Pretty tasty, too. Thanks for the kind words, and comment. Hi Bam, :-) Fun drink, isn't it? And quite tasty! I hope you have a great weekend, too. Thanks for the comment. "Great balls of fire! ", Indeed! This is a great post, John. What series on Tiki cocktails would be complete without a volcano? The chances of my making one are somewhere between slim and none. For me, some things are best left for vacations where palm trees and ocean breezes are involved. You know, some place where only a couple people that know me, if that, will see me fall off my bar stool and need help back to my room. This was another fun post, John, filled with information and fantastic photos. Thanks for taking the time to create it. Hi John, I'd normally leave this drink to a trained professional in an exotic location too, but now that I have the volcano bowl, I'm sure I'll find amusing uses for it! Thanks for the comment. You did the volcano justice with the photos. Cheers!! Hi Kiran, it was an awful lot of fun to take the pictures for this post. :-) Thanks for the comment. I love the idea of that flaming bowl and the combination of rums sounds delightful. Hi Suzanne, isn't this a nice combo of rums? They really blend so well together. Thanks for the comment. A lovely cocktail! I love the retro look of that bowl. This is such a fun series to follow! That's quite a punch of rum in this drink. I totally agree about the maple syrup. The real stuff can be expensive, but it goes a long way and is worth every penny. It's an interesting ingredient in a drink, but I can see it being good with rum. All you need now to go with this drink is a flaming PU PU Tray and you'll all be on fire! I so want a volcano bowl! Hi Rosa, isn't that bowl fun? Who could resist that! Thanks for the comment. Hi Kumar, it is indeed a zingy sip! And a fun one. :-) Thanks for the comment. Hi Kristi, the real maple syrup really does go a long way - plus the fact that it's real, not artificial, has to mean something, right? And I was surprised at how well it blends with the rum - you definitely get a tiny maple syrup aftertaste in this drink. Thanks for the comment. Hi Fran, call the fire department! ;-) I wonder if I can find a flaming Pupu tray - great idea! Thanks for the comment. Hi Debra, who doesn't? All the cool kids have them. ;-) Thanks for the comment. Hi Natalie, this is pretty bad, isn't it? ;-) Fun drink - of course you want one! Thanks for the comment. Ha! Love the 'tacky' bowl... great post, John. Such fun! What a dramatic and celebratory drink! I just turned 21 last week so I'll probably be trying out your recipes more often, John! ;) Need you as a personal bartender now. Hi Lizzy, isn't that tacky? ;-) But so much fun! Thanks for the comment. Hi Monet, I hope you and your friend have a chance to enjoy one of these together before too long! Thanks for the comment. Hi Krist, isn't it? ;-) Thanks for the comment. Hi Irina, happy belated birthday! I'll be happy to make a round for you. But I'll handle the matches on this one. ;-) Thanks for the comment. I think I would find it a little dangerous though, alcohol and fire... and me with alcohol and fire, something tells me this is an injury waiting to happen :0! Awesome image, though... and what a great party trick. Hi Gourmet, it is a tad dangerous, thus all the warnings in Step 4. And definitely you have to be careful when you have overproof alcohol and an open flame, so I only suggest doing this if you haven't yet had anything to drink. And for anyone who's apprehensive about it, find the nearest Tiki bar and order one there! Let them handle the fire. Great drink though! Thanks for the comment. What a super cool idea. I like to have something unique for my parties and this is just too cool. I saw this on foodgawker and was amazed. Thanks for sharing. Hi Asha, isn't this fun? Sounds like it'd be perfect for one of your parties! Thanks for the comment. After a long vacation here I am back again missing your cocktail recipes like that volcano bowl. Excellent pictures. Have a beautiful Sunday. Hi Ilke, the flaming part is fun, but it's rather dangerous, so probably better to skip that. You can still enjoy the bowl without the flame. ;-) Thanks for the comment. Hi Amelia, you definitely want to be careful of your hair when you light this! And your eyebrows. ;-) Thanks for the comment. Hi Raymund, hope you had a great vacation! Welcome back! Thanks for the comment. Man I would love to try your cocktail.... I love cocktails!!!!!!!!!!!!!!!! Hi Rika, it's a really fun drink. If you love cocktails, you'd really enjoy this! Thanks for the comment. OMG! I almost had a heart attack looking at your va-va-voom pictures...again! I must stop visiting this site as I can't take heart attacks anymore on a weekly basis. No kidding! I was being serious. Dead serious. Damned serious. Hi Nusrat, yeah, these pictures are pretty hot. ;-) And the drink is great, too. Thanks for the comment. Hi Nami, it was fun playing with matches! ;-) It's a great looking drink, and it tastes pretty good, too! Thanks for the comment. Hi Terra, there really is a lot of stuff in this drink, isn't there? But then, it's a lot of drink! ;-) Thanks for the comment. Hi Melanie, you do have to be careful, both in drinking this and lighting the flame! Thanks for the comment. Hi Jeanne, isn't that bowl great? Don't worry, once you light that thing, you'll have buddies you never knew before running to join the fun! ;-) Thanks for the comment.